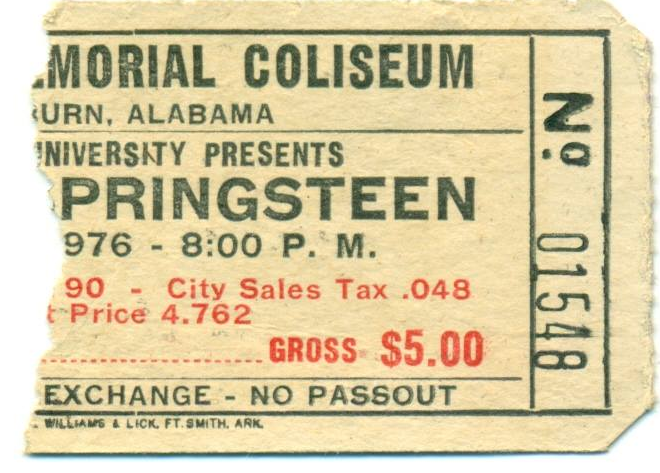 Somehow, only 1,500 students bought one of the 4,700 tickets put on sale for what turned out to be a non-stop two and a half hour Young Springsteen rockgasm—It’s My Life, Thunder Road, She’s the One—at Beard-Eaves Coliseum on May 11, 1976. TWER reader JBoggs was one of them. Here’s the shot from the Glom, which says he played May 13, rather than the 11th. Related: Bjork Damn Eagle II: Bjork ravishes an Auburn cup, and other new waves of secondhand nostalgia for the 1988 Sugarcubes concert on the Plains. I can’t believe footage of that exists. I seem to recall that I was standing stage right (just to the left of Danny Federici camera left) for a good part of the show. Indeed, even through 25 years in the music biz and having seen just about everyone at least once (including the Elvis AU show AND the Stones at the Fox Theatre) this is probably still my favorite show of all time. Cool. I wish/hope there is some footage of Jungleland-that was a real show-stopper that night. 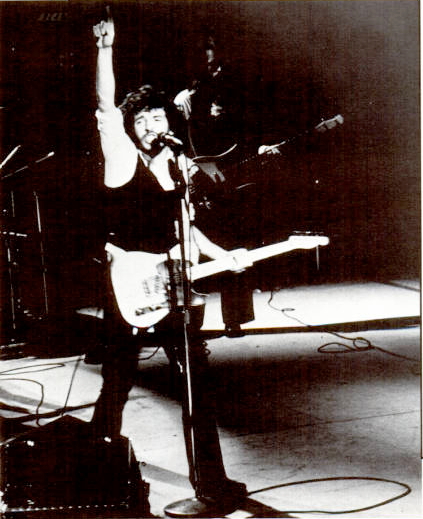 Anyone remember the hoax by the Springsteen impersonator a couple of days before the show? No — not that I would remember it, but I’ve never heard about it. What happened? Interesting look at how things used to be, but you’ve got one major factual error. The lawsuit between Mike Appel’s management company and Springsteen came after Born To Run was out, and wasn’t aimed at preventing a release, but to keep Springsteen from recording with anyone but Appel as producer. That’s why it took three years after Born To Run before there was another record, the suit had to be settled first. That portion of the tour was nicknamed by the road crew as the “Chicken Scratch Tour” because of the high proportion of secondary market, southern state locations. the small crowd was in great part due to it being the beginning of finals week. I remember being a good little boy and pulling an all-nighter for Kicklighter’s freshman History class. it didn’t help…all I did was think about the concert. I remember the hoax. Several days before the concert, someone claiming to be Bruce Springseen stopped by the campus radio station on the morning show. He said he was on his way down to Florida between concerts to see some relatives and was looking forward to coming back for the Auburn concert. They did the whole interview and everyone believed it. I still don’t understand the appeal. Can’t sing. Annoying saxophone. Every song sounds the same. I’d rather go to the dentist. He was (is) popular just because he was popular. Is The Boggins and JBoggs the same poster? The impersonator was Bud McLaughlin, I believe — a journalism major. I think he works in Huntsville now. A friend of mine was duped and got his autograph 🙂 . Best concert I’ve ever seen. Just guys on the stage pouring it out. No light show. No gimmicks. Just pure rocking talent. Tickets weren’t a problem. It was a free concert anyway. I don’t think the fake radio interview is true. I worked there at the time and don’t recall anything like that.